Healthy food shouldn’t be a luxury. Meat that doesn’t come pre-loaded with drug-resistant bacteria, meat with its natural proportion of healthy fats, meat with its natural concentration of vitamins and minerals – that kind of meat shouldn’t be restricted to the relatively few people who can actually afford it. Unfortunately, that’s not how the American food system works. For a lot of people, truly grass-fed meat is simply out of financial reach. Yes, it’s true that more people could afford grass-fed if they cut down on their new iGadget purchases or stopped eating out for lunch every day and cooked at home instead. For those people, it’s a problem of priorities, and the answer is to just bite the bullet and prioritize their health over always having the absolutely newest and trendiest everything all the time. For other people, it’s doable with just a little tweaking. They absolutely can’t afford grass-fed steak and bacon every day, but if they know how to find the affordable cuts, buy in bulk, and use other money-saving tips, they can fit grass-fed meat into the grocery budget without a strain. But for other people, it’s not about skipping on the $30 lunches, and they’re already buying only the cheaper cuts of meat. Some people have already stretched their grocery budget as tight as it can possibly go. All those luxuries they’re supposed to cut out? They’ve long since cut them, if they ever spent money on them in the first place. You can still eat Paleo without grass-fed meat. It won’t be absolutely optimal, but think of it this way: which is better for you, grain-fed sausage on top of a giant greasy pizza, or grain-fed sausage on top of a pile of broccoli? Don’t let the perfect be the enemy of the good; just because you can’t afford grass-fed meat doesn’t mean you should completely give up! Here are some tips for making the healthiest possible choices when you’re working with grain-fed meat – no judgement, just some advice to help you eat as well as you can within your budget. At the grocery store, focus on choosing the best options you can afford. In general, when you’re buying grain-fed meat, you want to buy lean cuts, because a lot of the potential toxins and bad stuff is stored in the fat of the animal. Factory-farmed meat also has a higher ratio of Omega-6 to Omega-3 fats, so if you’re concerned about inflammation, eating a lot of fatty conventional pork or chicken isn’t the best idea. Limit processed meats (which you should really be doing anyway) and very fatty meats like bacon, sausage, and pork shoulder. On the other hand, lean cuts can also be expensive because with everyone still being stuck in the low-fat model, the demand for lean meat is high (think chicken breasts compared to chicken wings: the price per pound is much higher for the breasts). Chicken: look for bulk bags of frozen chicken breasts (often cheaper than fresh). Tenderloins are sometimes cheaper than the breasts. Ground chicken is often pretty cheap, and quite lean. 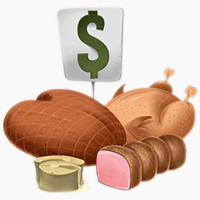 Turkey: turkey breast is often cheaper than chicken breast, if you can get it, and it’s just as lean. 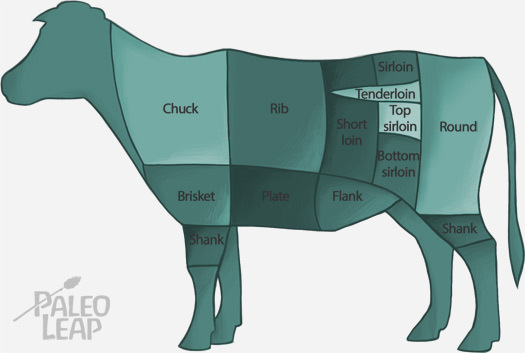 Beef: look for bone-in roasts, brisket, and chuck. Cook them low and slow for delicious, tender meals. Pork: look for bone-in chops (trim the fat off), but limit pork in general since it is fattier than other meats. Anything you can find frozen and in bulk is likely to be a cheaper option than fresh: check the freezer for bulk poultry. Then supplement your lean cuts with healthy fats. Coconut and olive oil are two great options, but another choice that might be more affordable than you think is grass-fed butter. Grass-fed butter will give you all the health benefits of fats from pasture-raised animal fat, like Vitamin K2, and it’s absolutely delicious. If you can squeeze an extra $3-4 into the grocery budget every week, grass-fed butter is probably the best way to supplement lean conventional meat, because it fills in a lot of the nutritional gaps. An even better option for cheap fat if you can make it work is to get pasture-raised animal fat from a local butcher or farmer. It’s even cheaper than cooking oil or butter (sometimes it’s actually free), and it’s delicious. Another consideration: eggs. Humanely-raised eggs are often cheaper than meat, and even the very cheapest of factory-farmed eggs are extremely nutrient-dense and have a great fatty acid profile. Any money that you have left over in your grocery budget because you weren’t buying expensive pre-packaged meals, processed foods, candy, soda, chips, or other junk. That stuff adds up fast! Compare your grocery receipts pre- and post-Paleo and save the difference. Any money that you have left over in your medical budget after going Paleo from medicines you no longer need, doctor’s visits you budgeted for but didn’t have to make, etc. Any money that you save from not eating fast food, or not ordering takeout. Add up your typical takeout bill for a month of pre-Paleo eating and stick that in the fund. Let it pile up for a while (and it might take some patience; don’t get discouraged if it doesn’t happen in a month), and then look into ways to buy half or a quarter of a cow in your area – this is typically the cheapest way to buy grass-fed meat per pound. While you’re eating the quarter-cow, you can add all the money you otherwise would have spent on meat to your next meat fund. In a perfect world, everyone would saunter down to the farmers’ market on Saturday for a leisurely chat with the farmer who raised their bacon before they moved on to pick out picture-perfect heads of lettuce and bunches of carrots from the next stall over. In the world we actually have, not everyone can afford to do that, even if they know how to look for the cheap cuts, and even if they’re already making all the sacrifices they can reasonably make to fit good food into the budget. If this is you, you can still eat Paleo. Don’t feel like you’re doing it wrong – you’re doing it as “right” as you can. Go for relatively cheap but lean cuts and supplement your diet with healthy fats – pastured butter, pastured animal fats, coconut milk, avocado, or healthy oils like olive and coconut oil. Consider starting a meat fund to save up for a bulk purchase. But most importantly, don’t beat yourself up over it. Imperfect Paleo is better than no Paleo at all; do what you can and let yourself off the hook for the rest.